The AHURI Research Centre at the University of South Australia is a joint centre of the Division of Education, Arts and Social Sciences and the Business School. Our centre is a member of the Australian Housing and Urban Research Institute (AHURI), a national, independent research network that provides high quality research to influence and improve policy development in relation to housing and urban needs. The aim of the AHURI Research Centre at UniSA is to bring together industry partners and high calibre researchers from a range of disciplinary backgrounds to develop policy-relevant, evidence-based research focussing on housing and urban subjects. Our researchers collaborate across divisions in UniSA, with other research institutions in South Australia and nationally, and with practitioners involved in the design, delivery and provision of housing and urban infrastructure, homelessness services, ageing and finance. Along with the research funding opportunities that arise through our partnership with AHURI, we also source grants and projects through industry and interdisciplinary collaboration. The AHURI Research Centre at the University of South Australia recently co-hosted the 2019 Australasian Housing Researchers' Conference with the University of Adelaide. Over three days we heard from a diverse group of researchers including plenary speakers Professor Sarah Johnsen, Professor Gavin Wood, Professor David Clapham and Professor Geoff Meen as well as presentations from local, interstate and international delegates on topics varying from homelessness research to new models of tenure and consumption to population ageing and housing. Some particular highlights of the conference were a panel of early career researchers chaired by Dr Hazel Easthope who discussed their visions for the future of housing research to 2040, the social, collegial atmosphere that existed throughout the conference, and the high calibre of the researcher presentations across the board.It was an honour to co-host the event with the University of Adelaide and we look forward to joining the next AHRC in 2020. Please feel free to send any feedback to our administrative email. Prior to the start of the 2019 AHRC, AHURI held its annual Top-up Scholars Symposium. 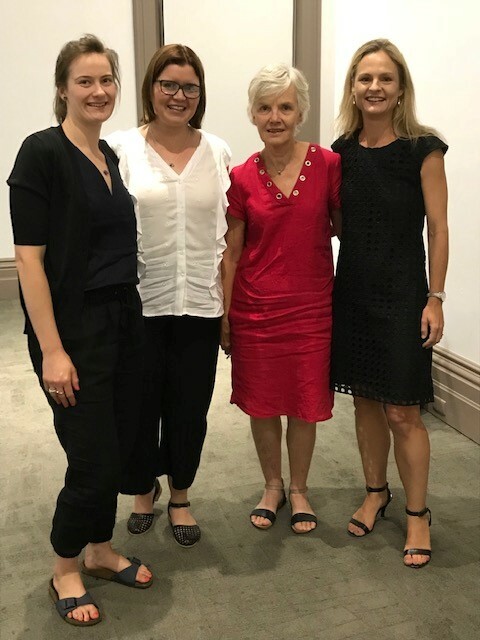 Our centre director, Associate Professor Christine Garnaut, attended the symposium along with UniSA's AHURI Top-up Scholars, Jess Porter, Christa Viljoen and Laura Hodgson. 'As an AHURI scholar, I had the opportunity to attend the 2019 AHURI Research Symposium together with 22 fellow PhD candidates on Monday and Tuesday, 4-5 February. Each of us had the opportunity to present our research, getting feedback and ideas from peers and senior academics. To me, there were many highlights during the two days. This included meeting with students who are also doing research on housing, but with many different focus areas. I met architects; planners; and finance professionals all working within the housing space but with very different backgrounds. As we are all in different phases of our candidature, it was possible to provide feedback but also to get advice from candidates who are close to completion. I had the opportunity to network but more importantly to make new friends. When I travel to Melbourne in March, two of the participants have already offered me a desk to work from at RMIT. We are both sad and proud to announce that our centre's administrative and project officer, Dr Kyra Wood, will be leaving the AHURI Research Centre at UniSA in mid February 2019, to take up a position as a Post-doctoral Fellow in timber design and construction at the Centre for Sustainable Architecture with Wood, in the University of Tasmania. We would like to thank Kyra for her contribution to our research centre in its formative years and look forward to seeing where this new trajectory will take her. We are delighted to congratulate Associate Professor Deirdre Tedmanson and her research team on their successful application for funding in AHURI's NHRP 2019 agenda. For further details about this and other successful applications that involve researchers from the University of South Australia, please follow the link to our end of year news bulletin below. The AHURI Research Centre at UniSA has established a series of 'workgroups' involving researchers from across the divisions of Education, Arts and Social Sciences and the UniSA Business School. Each workgroup collaborates on a particular theme related to the AHURI agenda. So far our workgroups incorporate three primary research themes, which are housing, homelessness, and ageing-related housing inquiry. We are also currently in the process of establishing an urban workgroup. Within these workgroups researchers from different divisions and from different disciplines within the same division are invited to meet and discuss potential research crossovers and areas of interest, to form working relationships and build their track record of interdisciplinary research outputs. Although the annual AHURI NHRP Agenda changes from year to year, the aim of our workgroups is to continue to practise, strengthen and develop research in related areas. If you are already involved in one of our workgroups, the below links will redirect you to our main SharePoint site and to individual sites for your workgroup. Please note these links require UniSA login details. Administration for this centre is currently based in the School of Art, Architecture and Design. Are you supervising a PhD? Part of AHURI's aim is to encourage and support the involvment of PhD candidates in AHURI-related topics. We invite supervisors whose PhD student's topic is aligned with AHURI's research interests to advise our centre administration. Students within the first year of candidature may be eligible to apply for an AHURI Top-up Scholarship. The AHURI website regularly publishes reports on research completed by its members, as well as work in progress, under 11 key themes. Their themes include: Financing Social and Affordable Housing, Home Ownership, Homelessness, Housing Aspirations and Careers, Housing Assistance and Social Policy, Housing and the Economy, Indigenous Housing, Private Rental Market, Supply of and Demand for Social and Affordable Housing, Tax and Housing Policy, and Urban Planning and Housing. To access these reports and see the kind of research produced by AHURI funded collaboration, please visit the AHURI homepage, or click on the research themes outlined above and you will be redirected to the relevant pages.